Howdy farmers!. . You can finally invite other players to your co-op! . . FEATURES:. * Co-op - Finally, you can invite other players to your co-op! Yay!. * New tournament leagues - Prove your skills and move up to the Emerald League . * New event - Make sure you don&apos;t miss the trader and get great discounts on various items. . * New building levels - Level up your farm buildings even further. * Expansion discount - Get it now on your adventure farms, too. . Happy farming! When Uncle George wills you an old farm, it is your time to step up your farming skills and turn an overgrown field into a flourishing business. Plant, harvest and crop your fields and take care of all your animals. Prove your business skills by selling your crafted goods on the organic market. Buil... see more When Uncle George wills you an old farm, it is your time to step up your farming skills and turn an overgrown field into a flourishing business. Plant, harvest and crop your fields and take care of all your animals. Prove your business skills by selling your crafted goods on the organic market. Build all kinds of fields, stables or production buildings and decorate your farm with stunning decorations. Use your profits, so you can keep upgrading and expanding your farm until you become the greatest farmer far and wide! Take your new farm everywhere. What are you waiting for? Let&apos;s get started! 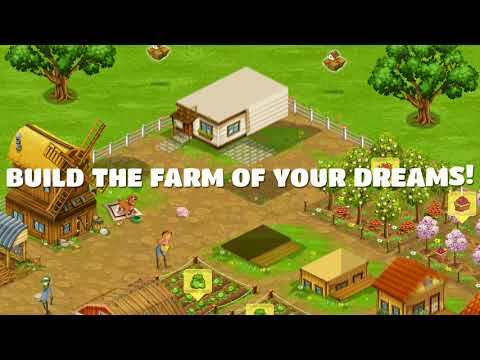 Play Big Farm: Mobile Harvest now for free!